Baby Signing Research - Baby Hands Productions, Inc.
Childhood development researchers have been studying the results of teaching hearing babies to sign for more than twenty years. Research in this field is expanding each year as the benefits of using sign language with preverbal babies becomes more compelling to researchers as well as parents. In 1982, two researchers, Drs. Linda Acredolo and Susan Goodwyn noticed that young babies were spontaneously using simple hand movements to represent words they weren’t yet able to say. This discovery prompted Acredolo and Goodwyn to conduct research, which spanned two decades, to study the effects of teaching hearing babies to sign. Much of this research was funded by the National Institutes of Health. Acredolo and Goodwyn conducted a longitudinal study that involved 103 eleven month old babies. What these researchers found was amazing, babies that communicated with sign language before they could speak actually learned to talk sooner and scored higher on intelligence tests when compared to their non-signing peers. These babies developed larger vocabularies, displayed more self-confidence and engaged in more sophisticated play than their non-signing peers. Even at age eight, children who had learned to sign as infants scored significantly higher on IQ tests than those who had not! In addition, the parents of these babies reported a decrease in frustration and a strengthening of the bond between themselves and their babies. Goodwyn, S.W., Acredolo, L. P. & Brown, C. (2000). 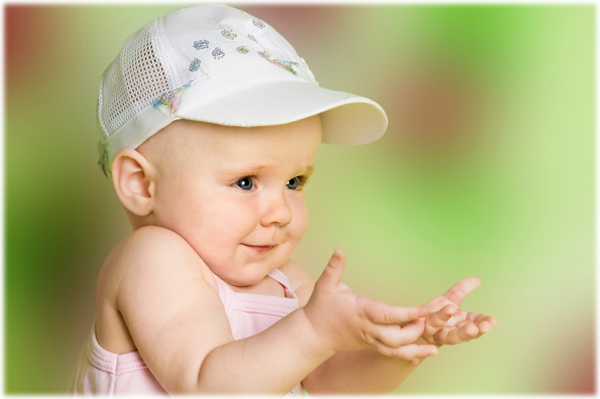 Impact of Symbolic Gesturing on Early Language Development. Journal of Nonverbal Behavior, 24, 81-103. Acredolo, L. P., & Goodwyn, S.W. (July 2000). The long-term impact of symbolic gesturing during infancy on IQ at age 8. Paper presented at the meetings of the International Society for Infant Studies, Brighton, UK. Brie Moore, Linda Acredolo, & Susan Goodwyn (April 2001). Symbolic gesturing and joint attention: Partners in facilitating verbal development. Paper presented at the Biennial Meetings of the Society for Research in Child Development. A pilot study was conducted by Dr. Kimberlee Whaley in 1999 at the A. Sophie Rogers Infant-Toddler Laboratory School at Ohio State University. Dr. Whaley found that babies as young as nine months of age were able to communicate with their teachers by using sign language. Allott, R. (1994) Gestural Equivalents of Language. Marilyn Daniels found that preschoolers who were taught sign language scored significantly higher on the Peabody Vocabulary Test when compared to preschoolers who did not learn sign language. Daniels concluded that a preschooler’s vocabulary can be improved if words are presented visually and kinesthetically as well as verbally. Daniels, M. (1994). The Effects of Sign Language on Hearing Children’s Language Development. Communication Education, October, v43 n4, p291 (8). Daniels, M. (1996). Seeing Language: The Effect Over Time of Sign Language on Vocabulary Development in Early Childhood Education. Child Study Journal, 26, 193-208. Daniels, Marilyn, Dancing with Words: Signing for Hearing Children’s Literacy. Bergin & Garvey, October 2000. ISBN: 0897897927. Copyright © 2019 Baby Hands Productions, Inc.